Chapter 1 Introduction What's a QuickTime Movie? What's QuickTime? QuickTime File Format Applications and Plug-ins QuickTime API Who Gets What Delivery Methods: Disk, Streams, Web Server Local Delivery Streaming Server Delivery Web Server Delivery Which Should You Choose? QuickTime is the industry standard for developing and distributing multimedia content on the Web and CD-ROM, for both Windows and Macintosh computers. This book includes QuickTime Pro 6 and a full set of content development tools for both Windows and Macintosh developers. 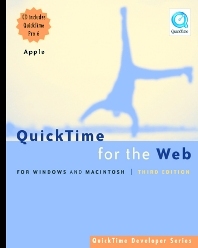 This third edition of the best-selling and award-winning QuickTime for the Web is a hands-on guide showing how to integrate animation, video, recorded sound, MIDI, text, still images, VR, live streams, games, and user interactivity into a Web site. It now also covers how to benefit from QuickTime support for the MPEG-4 global multimedia standard. Written for Web masters, site designers, HTML and multimedia authors, and anyone else who wants to incorporate sound or video into their Web site, this book offers clear and detailed instruction in an engaging style. Written by an expert at Apple Computer, this is the most complete and authoritative source for creating QuickTime content for the Web. The first edition of this book won the Touchstone 2000 Merit Award for Books awarded annually by STC (Society for Technical Communications). Written for both Windows and Macintosh developers. Illustrates all the latest features in QuickTime Pro 6, including MPEG-4 support. Web Developers, Webmasters, Site Designers and Multimedia Authors. Apple Computer, Inc., Cupertino, California, U.S.A.